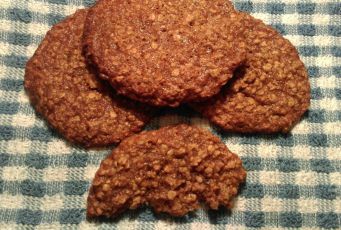 Cinnamon & Apple Oatmeal Cookies – Create, Make & Bake! I was intending on making flapjacks but I decided on doing some cookies instead. I think the recipe works well as a cookie but would also be brilliant in put into a flapjack tin. Cream together the margarine, dark brown sugar & caster sugar. Next stir in the egg, water, apple sauce & vanilla. Combine the flour, salt, bicarb & cinnamon in a separate bowl and stir into the creamed mixture. Finally, stir in the oats. Place rounded spoonfuls onto the prepared baking tray, I made them around golf ball size. Bake for 12 to 15 minutes in the preheated oven. Cool on baking trays for a couple of minutes then place on wire racks to finish cooling, these were so moreish when still warm.